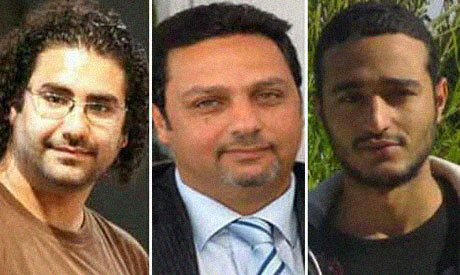 From left to right: Egyptian activists Alaa Abdel Fatah, Hazem Abdel-Azim and Ahmed Douma(Photo: Ahram Arabic News Website). A Cairo criminal court on Sunday cleared twelve activists of inciting violence during confrontations outside the Muslim Brotherhood's Cairo headquarters in March. Defendants included outspoken political activist Ahmed Douma, blogger Alaa Abdel-Fattah, journalist Nawara Negm, opposition National Salvation Front member Hazem Abdel-Azim, Constitution Party member Ahmed Eid and political activist Karim El-Shaer. The activists were accused of inciting an assault on the Islamist group's headquarters in Cairo's suburban Moqattam district last March, in what became deadly clashes between pro- and anti- Brotherhood protesters. Anti-Brotherhood protesters were reportedly attacked by members of the Islamist movement – which fielded former president Mohamed Morsi in last year's presidential elections – while drawing anti-Brotherhood graffiti outside its office last March. Defence lawyer Sameh Ashour claimed the case was trumped up by prosecutors. He contended that his clients were beaten and dragged on the streets by Brotherhood supporters a week before the incident. Ashour went on to argue that his clients did not storm the office, which was cordoned off by police at the time of clashes. Douma – a member of Egypt's opposition Popular Current movement – was the only one to be detained on the charges and was granted release on Saturday. After being held in custody for two months, Douma was convicted of a number of charges including insulting the president and circulating false news on a television programme. In June, he was sentenced to six months in jail for calling the former president a killer and a criminal who had escaped justice. This means it is okay to attack the Brothers, and get away with it. There are Ikhwan leaders, however, who have been arrested for "inciting" violence in protecting their headquarters against these not-so-innocent anti-Brotherhood attackers. This seems like the new "justice" now - a major contradiction in terms.